Service Fabric projects have evolved at what feels like a cracking pace, along with the .Net Core platform and tooling, and with the recent release of Visual Studio 2017 no doubt you are considering the productivity merits of upgrading (container support). For Service Fabric projects designed in Visual Studio 2015 and using the .Net Core .xproj/project.json structures now deprecated in Visual Studio 2017, the automatic upgrade process may result in only partial conversion success. In this article we’ll take a look at the issues encountered while upgrading a .Net Core Service Fabric solution containing 77 .xproj/project.json projects to Visual Studio 2017. 1>C:\Microsoft Visual Studio\2017\Enterprise\MSBuild\15.0\Bin\Microsoft.Common.CurrentVersion.targets(1964,5): warning MSB3270: There was a mismatch between the processor architecture of the project being built "MSIL" and the processor architecture of the reference "C:\Users\Admin\.nuget\packages\microsoft.servicefabric.services\2.1.150\lib\net45\Microsoft.ServiceFabric.Services.dll", "AMD64". This mismatch may cause runtime failures. Please consider changing the targeted processor architecture of your project through the Configuration Manager so as to align the processor architectures between your project and references, or take a dependency on references with a processor architecture that matches the targeted processor architecture of your project. We’ve looked at some simple changes you can make to your converted and upgraded Service Fabric project files. The changes allow you to write your Actor, Stateful and Stateless services in .Net Core while taking advantage of the great new productivity gains (Azure integration, Docker support etc.) offered by Visual Studio 2017 and Service Fabric! In our next article we’ll continue the upgrade journey by walking through a few DevOps limitations encountered while reconfiguring a Service Fabric Visual Studio Team Services CI/CD pipeline. When an event such as the one above is logged, it includes a payload containing individual variables as typed values that match a pre-defined schema. Moreover as we’ll see later on in this article, when the event is routed to a suitable destination such as Application Insights, the event’s payload is written as discrete elements making it much easier to analyse, correlate and query. For those new to Application Insights the following offical introduction provides a good starting point. Having briefly defined semantic logging and mentioning that it’s baked into Service Fabric we should clarify that ServiceEventSource and ActorEventSource inherit from EventSource, which in turn writes events to ETW. Event Tracing for Windows or more commonly ETW is an efficient kernel-level tracing facility built into Windows that logs kernel or application-defined events. 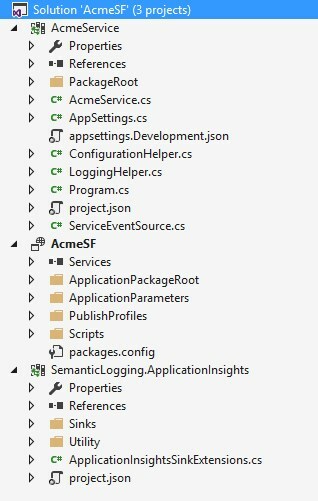 Given the above we now turn our attention to exporting these ETW events to Application Insights or for that matter to any other supported target via two libraries, the Microsoft library aptly named Semantic Logging (formerly known as the Semantic Logging Application Block or SLAB) and the SemanticLogging.ApplicationInsights library (also known as SLAB_AppInsights). Add an appsettings.Development.json file and make sure to set your ASPNETCORE_ENVIRONMENT variable accordingly. Moreover you will need to set the Application Insights InstrumentationKey. And that’s about it… how simple is it to get your Service Fabric application events sent to Application Insights! Given the event producer (your Service Fabric application) is decoupled from the target through the magic of ETW and Semantic Logging libraries, the exact same approach and with minimal code changes successfully allows me to target Elastic Search as the event target. In fact for your systems you might also prefer to send some events to Application Insights and others to an Elastic Search cluster. Lastly I would like to conclude by saying if you find any of the above useful in your projects do consider contributing to Fidel’s excellent library or by creating completely new sinks for Semantic Logging! 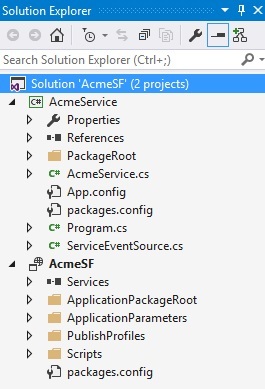 Note: the value of Acme.ASPNETCORE_ENVIRONMENT is "ASPNETCORE_ENVIRONMENT". Make sure ASPNETCORE_ENVIRONMENT is set on your target environment accordingly. Moreover the AppSettings class definition must correspond to the content of your appsettings.json file, as otherwise the configRoot.Bind(appSettings) will fail. In a previous article we walked through the process of hosting our Asp.Net Core Web Microservice within Service Fabric and also self-hosting outside Service Fabric via Kestrel for development and debugging. Today we’ll discuss how we can create a new .Net Core Service Fabric Microservice targeting the full stack (.net46), given the VS 2015 template only supports web projects currently. Note that similar principles would apply to converting existing Microservice projects to .Net Core xproj structure. 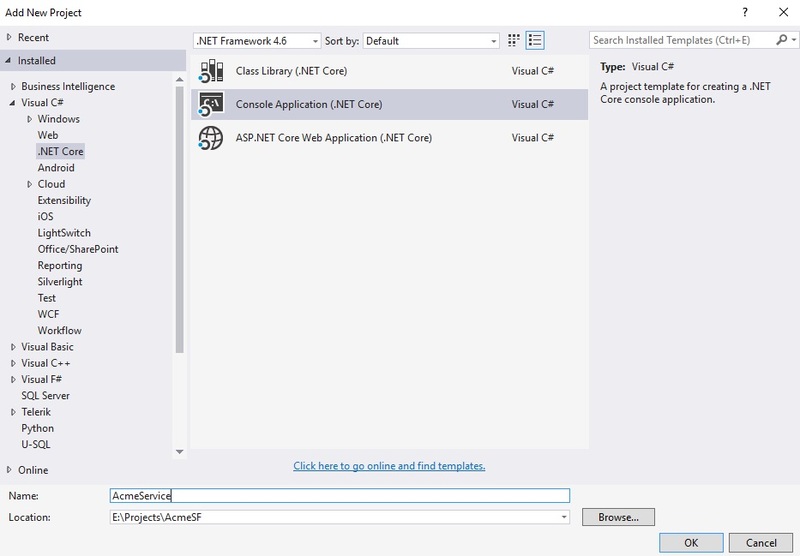 Lastly we have to add back our .Net Core Console Application project by right clicking on the Service Fabric project and selecting Add Existing Service Fabric Service. You might get a warning about updating but just click OK. You can also delete the AcmeService.tmp folder as it’s no longer needed. In the next series of articles we’ll look at some more advanced topics such as sharing appsettings.json files between Web and other Microservice projects, as well as logging to Application Insights. Service Fabric SDK 2.1.150 comes with an ASP.NET Core project template so you can easily include a web app or web service in your Service Fabric application. To get started follow this official article: Build a web service front end for your application, but for more advanced scenarios such as hosting your .Net Core web application outside Service Fabric (for those times you just don’t want to deploy), forcing Kestrel to listen to all machine assigned IP addresses, we’ll customise and extend the starter template generated code. Moreover, with .Net Core RC2 and RTM the ubiquitous dotnet.exe becomes our preferred tool of choice so let’s facilitate running your Service Fabric Web app for development and debugging with the same simple command dotnet.exe run. As always and given I am still targeting .Net Core RC2, we’ll start with the required project.json dependencies which should look something like the below. For command line argument heavily lifting include the “CommandLineParser”: “2.0.275-beta” package. To overcome the above limitation and to make the process as easy as possible, we’ll employ a customised Azure Resource Manager (ARM) template which we’ll first generate via the Azure Portal. To get started simply click on the following link https://portal.azure.com/#create/Microsoft.ServiceFabricCluster or in Azure Marketplace search for Service Fabric Cluster. As there is great guidance and content on Microsoft’s Azure portal, I won’t repeat the steps on Deploying a Service Fabric Cluster using an ARM template however I will ask you to complete all the fields as you normally would (login, password, custom ports for http and https), but instead of pressing create and deploying your cluster we’ll opt to download the ARM template. Continuing on from a previous post this article details my journey in upgrading a Service Fabric multi-tenant application from .Net Core RC1 to RC2, which turned out to be a breaking albeit worthwhile change, specifically for the Startup.cs class and related boot strapping code for Swagger, CookieAuthentication, OpenIdConnectAuthentication and JwtBearerAuthentication. In subsequent posts we’ll explore how .Net Core RC2 hosts web applications but for now let’s look at the first challenge encountered during the upgrade, which was to chase down all required libraries that are also .Net Core RC2 compatible. As of the time of writing, I could only get Swashbuckle version 6.0.0-beta9 to work with .Net Core RC2. The below code supports multi-tenant Azure AD authentication and is meant for development scenarios as ValidateIssuer and RequireHttpsMetadata are both set to false for simplicity. Concluding the changes required for the .Net Core RC2 upgrade, we dive into the Configure method. Canny readers will notice that UseCookieAuthentication, UseOpenIdConnectAuthentication and UseJwtBearerAuthentication have been refactored to handle options in a more consistent manner with the rest of the .Net Core APIs. Visual Studio Online build definitions & tasks have certainly come a long way since the old xaml template days. There is even a VSO extensions market place. For my current project we are using good old PowerShell based tasks which work together to continuously deploy the solution from VSO to a single node Azure VM Service Fabric cluster which runs all unit, integration and automated UI tests. Some PowerShell snippets which I’ve found helpful along the way are detailed below. Write-Host "$(Get-Date) ....http://localhost is unreachable, sleeping for 30sec"
Write-Host "$(Get-Date) ....http://localhost is now reachable, continuing"
Working with Asp.Net Core and Angular 2 at the time of writing may feel like a trail blazing experience, especially given the lack of documentation and stability in the underling frameworks, libraries and tools, leading to lost time in debugging and searching for answers. In the hope of documenting some of my own recent experiences integrating these technologies and Microsoft’s micro-services framework Service Fabric, I’ll dive into specific code areas which have proven fiddley. To start off I should preface that the version of Asp.Net Core I’m currently targeting is RC1 and some bugs and workarounds will not apply to subsequent framework versions. 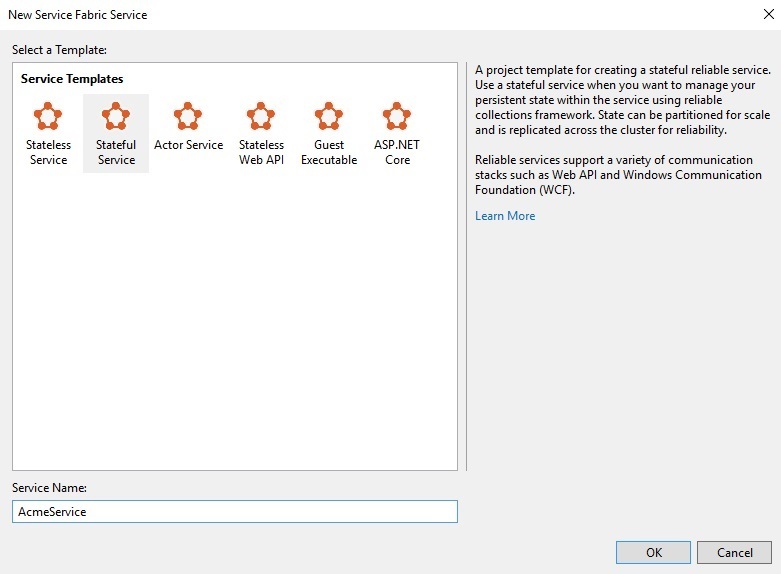 Moreover the Service Fabric version targeted is Service Fabric SDK (version 2.0.217) and Service Fabric Runtime (version 5.0.217). 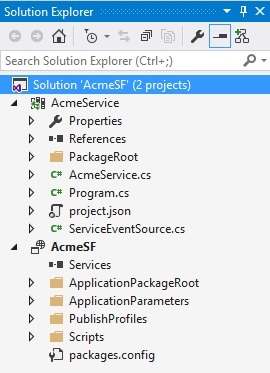 To begin, we’ll start by configuring CookieAuthentication, OpenIdConnectAuthentication, JwtBearerAuthentication, Mvc & SPA routes in our Asp.Net Core Web project Startup.cs file. Note that the below code supports multi-tenant Azure AD authentication and is meant for development scenarios as ValidateIssuer and RequireHttpsMetadata are both set to false for simplicity. 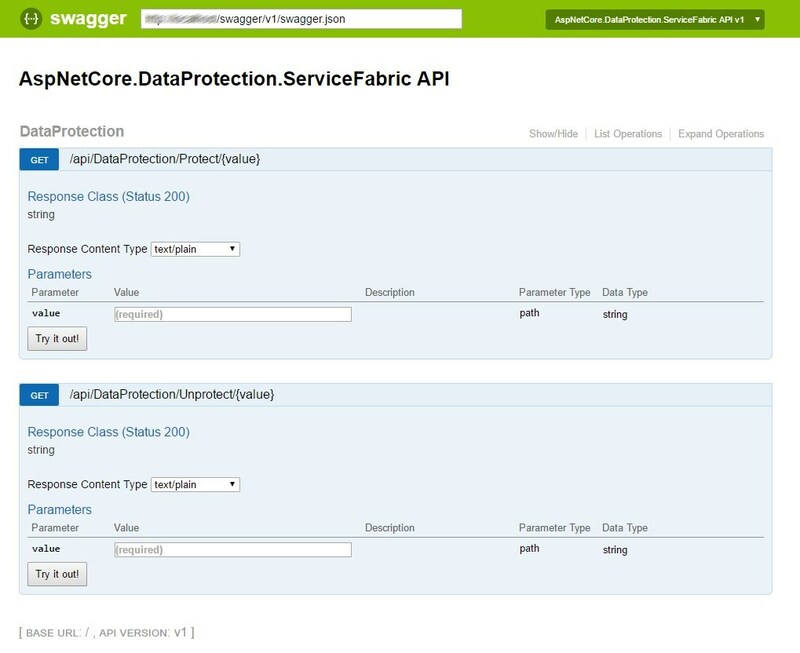 In Part 2 we’ll upgrade our code to Asp.Net Core RC2 and add support for Swagger and AutoRest. Much work has gone into making continuous integration & deployment of Azure Websites as simple and low friction as possible with support for Visual Studio Online, Git and BitBucket etc. For customers and teams still using TFS on-premise and working with Web Roles (Azure Cloud Services) the experience is a little more involved with many resorting to rolling their own solutions, TFS Build Templates and PowerShell scripts, if tools like Octopus Deploy and platforms like appveyor are beyond reach. Before we proceed a small caveat, in part one we’ll look at automating just the deployment of files and code which have changed. This should suffice for most single instance Dev and Test scenarios, where code is compiled and deployed on hourly, daily cycles. For Production you will also want to deploy the .cspkg file in case Azure reprovisions your Web Role instance(s). I’ll assume you already have knowledge of the TFS build process, in addition to having source and build TFS server environments configured, I’ll skip straight to the MSBuild parameters as this is where most of the magic happens. I’ll also assume you have the latest Azure SDK and Visual Studio files installed on your build server. By VS files I mean the files required by the BuildProcessTemplate, in my case a customised version of the DefaultTemplate.11.xaml. PowerShell scripts could be used for the Cloud Service provisioning step however for simplicity I’ve opted for a manual step where I use the Microsoft Azure Publish Settings wizard in VS 2013 and do an initial once off deployment of my Web Role to Azure, making sure to enable Remote Desktop for all roles and Enable Web Deploy for all Web Roles. You will need to take note of the username and password created during this process as they are used later as MSBuild arguments. Once you have successfully Published your Web Role to an Azure Staging Slot, you will need to repeat the process for the Production Slot, so that we can use the Swap Deployment Slots feature (endpoints have to match) once our tests have passed. To create a new Dev build definition in Team Explorer I select my preferred Source Setting, Build Defaults, Trigger values, Build Template etc. Note in the MSBuild arguments below UserName and Password are values you defined when using the Microsoft Azure Publish Settings wizard in VS 2013. Moreover I am targeting a Debug build, specifying the VisualStudioVersion which for VS 2013 happens to be 12.0. The MsDeployServiceUrl will always be in the form https://xyz.cloudapp.net:8172/MSDeploy.axd where xyz is either your Cloud Service name or the ID Azure generates for your Staging Web Role. If you are unsure what this value needs to be go to Server Explorer and drill down the Azure Cloud Services until you find your Staging environment. Selecting the Staging node right click Properties: you will see the value for Name is in the form of a GUID. Use this value and replace xyz. To find your DeployIisAppPath value expand the Staging Node, expand the Web Role and select Instance 0, right click Properties: you will see a Name value in the form Contoso.Web_IN_0. Use this value as your DeployIisAppPath. Many of us have been using SQL Server’s built-in Identity value feature for as long as we can remember but when running SQL Server in HA scenarios such as AlwaysOn Availability Groups, there are a couple of things to take into consideration. For existing Applications using Sequence might not be an option. In this case a scarcely documented workaround might be to set a Start-up Parameter on the SQL Server Service: -t272. The lowercase “t” is an internal trace flag that is used by SQL Server support engineers. An interesting customer requirement last week came up where I needed to upload an image in MVC 5 directly to Azure Blob Storage. A simplified version follows, removing some application specific logic and validation steps. To start off I first created a MVC model for image upload purposes. For additional validation control over the upload, create a custom ValidationAttribute called MaxFileSizeAttribute. Now let’s turn our attention to the actual Azure logic which streams the upload direct from MVC memory to Azure Blob Storage. Note that CloudConfigurationManager is used to source relevant connection information required by the Azure libraries, something I hope to cover in another post as it’s a very relevant topic for Cloud first .Net solutions. Lastly the Controller handling the upload. Recently I needed a quick and low friction way of extending Asp.Net Identity 2.0, tying into the Entity Framework 6 way of working with custom fields and table mappings. To accomplish this first create something similar to a new ContosoIdentityUser which inherits from IdentityUser. We then likewise create a new ContosoIdentityDbContext which inherits from IdentityDbContext.